The pyramid is estimated to have around 2,300,000 stone blocks that weigh from 2 to 30 tons each and there are even some blocks that weigh over 50 tons. The Pyramid of Menkaure, the Pyramid of Khafre and the Great Pyramid of Khufu are precisely aligned with the Constellation of Orion. The base of the pyramid covers 55,000 m2 (592,000 ft 2) with each side greater than 20,000 m2 (218,000 ft2) in area. The interior temperature is constant and equals the average temperature of the earth, 20 Degrees Celsius (68 Degrees Fahrenheit). The outer mantle was composed of 144,000 casing stones, all of them highly polished and flat to an accuracy of 1/100th of an inch, about 100 inches thick and weighing approx. 15 tons each. The mortar used is of an unknown origin (Yes, no explanation given). It has been analyzed and its chemical composition is known but it can’t be reproduced. It is stronger than the stone and still holding up today. Center of Land Mass: The Great Pyramid is located at the center of the land mass of the earth. The east/west parallel that crosses the most land and the north/south meridian that crosses the most land intersect in two places on the earth, one in the ocean and the other at the Great Pyramid. The centers of the four sides are indented with an extraordinary degree of precision forming the only 8 sided pyramid, this effect is not visible from the ground or from a distance but only from the air, and then only under the proper lighting conditions. 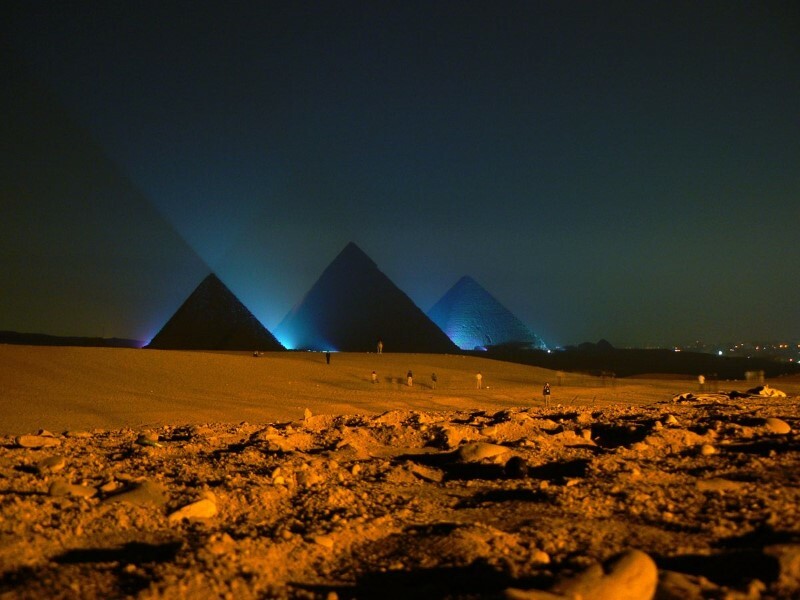 This phenomenon is only detectable from the air at dawn and sunset on the spring and autumn equinoxes, when the sun casts shadows on the pyramid. The coffer was made out of a block of solid granite. This would have required bronze saws 8-9 ft. long set with teeth of sapphires. Hollowing out of the interior would require tubular drills of the same material applied with a tremendous vertical force. The southern shaft in the King’s Chamber pointed to the star Al Nitak (Zeta Orionis) in the constellation Orion, circa 2450 BCE The Orion constellation was associated with the Egyptian god Osiris. No other star aligned with this shaft during that time in history. The curvature designed into the faces of the pyramid exactly matches the radius of the earth. Khufu’s pyramid, known as the great pyramid of Giza, is the oldest and largest, rising at 481 feet (146 meters). Archaeologists say it was the tallest structure in the world for about 3, 800 years. You can’t see it, or figure out its shape: Is this the real new black?